Last weekend the San Francisco Silent Film Festival filled the Castro Theatre with many programs of dramas, adventures and comedies. The comedies—featuring Buster Keaton, Max Linder, Fatty Arbuckle and Charlie Chaplin—had the audiences laughing long and loud. 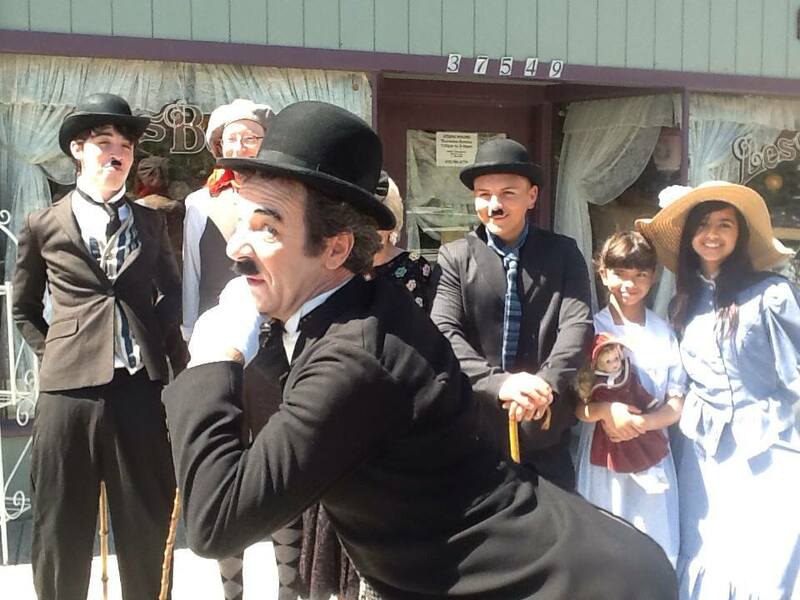 This weekend, Saturday and Sunday, June 7-8, will be another weekend filled with Chaplin laughter and fun when the East Bay’s Niles Essanay Silent Film Museum once again hosts “Charlie Chaplin Days.” On both days a series of Chaplin shorts filmed in Niles will be shown for a 50¢ donation. Saturday will also include some documentaries. Sunday has its own special events, highlighted by a presentation from John Bengston about the Bay Area locations used for Chaplin’s films. Bengston’s website is fascinating. The featured event will be the Chaplin Lookalike Contest. At last year’s event, there were Charlie babes-in-arms to seniors, male and female, and of many races. It was a sight to behold, especially when they all went for ice cream sundaes after the contest. In July 1915 more than thirty New York theaters held Chaplin lookalike contests. It’s said that Bob Hope was a winner. Walt Disney entered these impersonation contests dozens of times, eventually ranking the second best in Kansas City. They were staged all over the world, including Bellingham, Washington in 1922. A Chaplin lookalike contest promoting THE IDLE CLASS (November 5, 1922). Photo by J.W. Sandison; Whatcom Museum, Bellingham, WA. It’s rumored that Chaplin himself entered such contests. 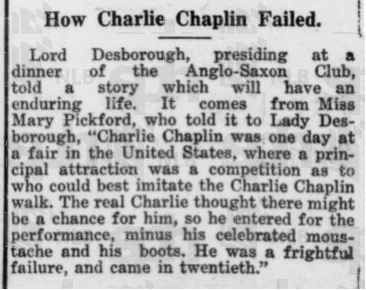 Mary Pickford told one story as reported in various newspapers in August, 1920. Such often-told tales, though entertaining, have yet to have their truthfulness verified. There were professional imitators too. 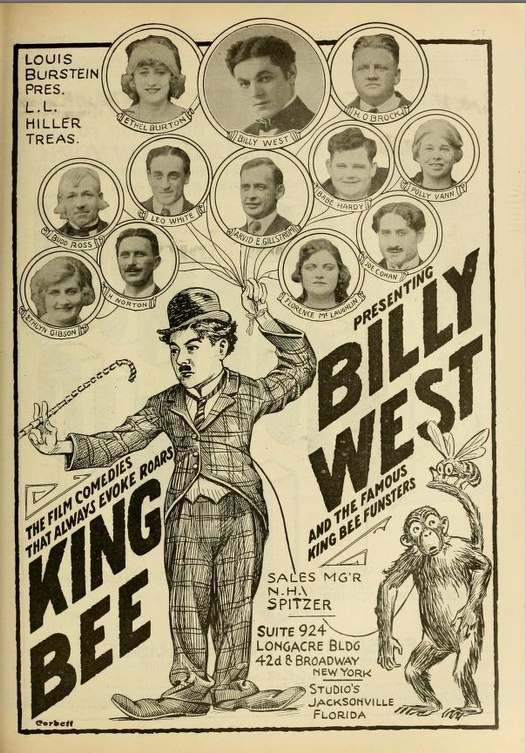 Billy West made over 50 films as a mustachioed little tramp. Even Harold Lloyd did a series called Lonesome Luke where he clearly was impersonating his mentor. Stan Laurel (before joining Oliver Hardy) was Chaplin’s understudy for his British music hall stage act and Laurel later developed his own tramp act. Many animated cartoons featured the Little Tramp. When Mexican actor Charles Amador became “Charlie Aplin,” the similarity of both the tramp character and the name resulted in an extended lawsuit filed by Chaplin. The Faux Charlot is an entire website dedicated to Chaplin impersonators. Niles–a historic district in Fremont, California–is a delightful place to visit with its historic buildings, Niles Canyon Railway, museums, many antique shops and excellent restaurants. I have eaten well at The Vine and Nile Café and heard reports of other excellent places to dine. The Silent Film Museum has a large and dangerous gift shop with everything you could want relating to classic movies. Plus there are great hiking trails nearby. Read more thoughts from Gary on Chaplin here: Charlie Was My Co-Pilot. Gary Meyer fell in love with the movies at 7 years old, opening the Above-the-Ground Theatre in Napa when he was twelve, screening silent and sound classics plus his own productions. With a Bachelor’s degree in Film Production at San Francisco State University, Gary co-founded Landmark Theatres in 1975, the first national art house chain in the U.S. focused on creative marketing strategies to build loyal audiences for non-Hollywood fare. After selling Landmark, he consulted on projects including creating business-marketing-programming plans for Sundance Cinemas and the Brooklyn Academy of Music’s Rose Cinemas; creating the Dockers Classically Independent Film Festival and Tube Film Festival for the X Games; and resurrecting the 1926 Balboa Theatre in San Francisco. Meyer joined the Telluride Film Festival in 1998, becoming a Festival Co-Director in 2007. Now a senior curator at Telluride, Meyer also founded the online magazine, EatDrinkFilms.com in 2014, with the EatDrinkFilms Festival to tour nationally in 2015. This entry was posted in Films and tagged Charlie Chaplin, Films, Niles, Niles Essanay Silent Film Museum, special event. Bookmark the permalink.